I woke up to snow this morning. The first snow of the season so I think that makes it special. The flakes were drifting in the wind, going in all directions as the sun rose. I hope this monday morning finds everyone in good spirits. 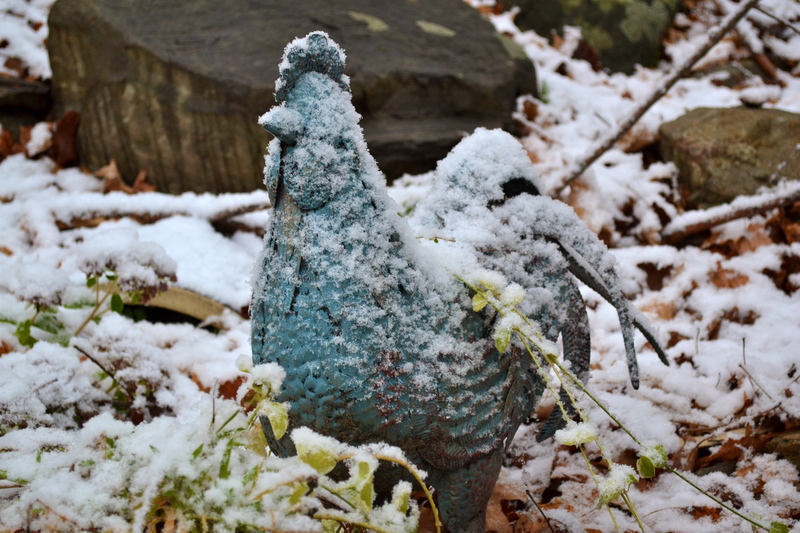 My garden chicken looks so pretty covered in fluffy flakes. I was up very early this morning — just one of those days that once I woke up I could not go back to sleep. 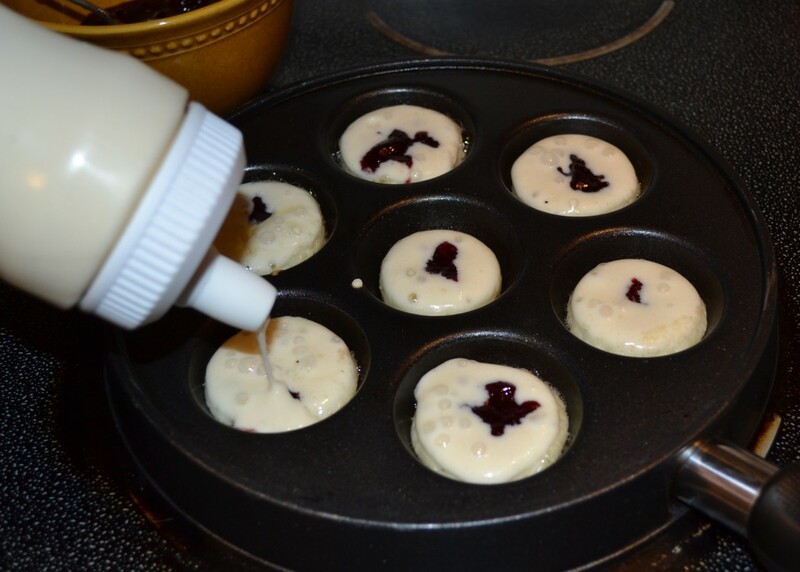 I was inspired by my pre-dawn rise to make ebelskivers for breakfast. I do not make them very often but as my sister is visiting it is a special occasion that warranted cooking up these round puffs of deliciousness. They are a traditional Danish breakfast treat that sometimes has apple chunks or applesauce added to them. I have not made them with apples but I do add spoonfuls of red raspberry preserves into each and we enjoy them that way or plain. 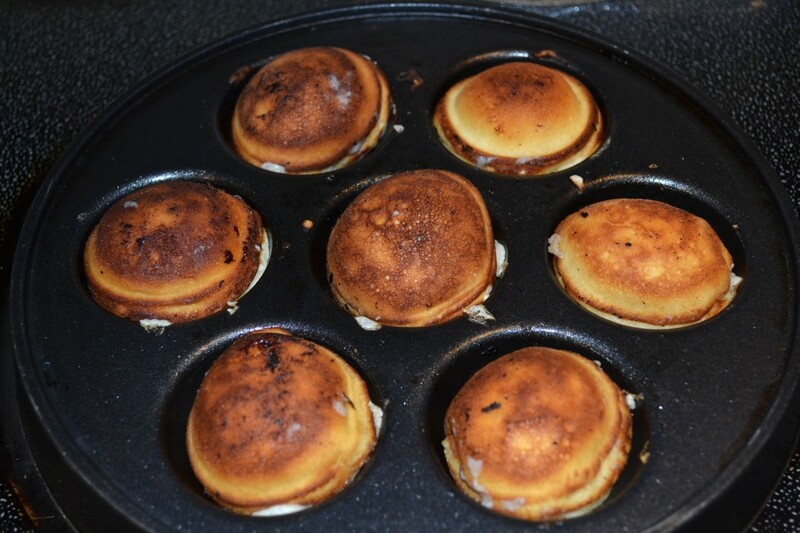 You must have an ebelskiver pan. 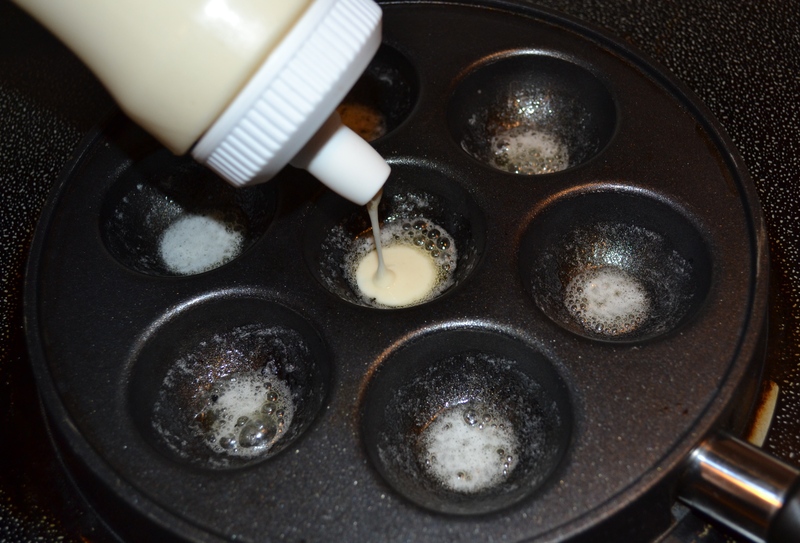 They can be found at most cooking stores like williams-sonoma, nordicware, amazon, etc. and sell for about $20 each. First, pull out your ingredients. 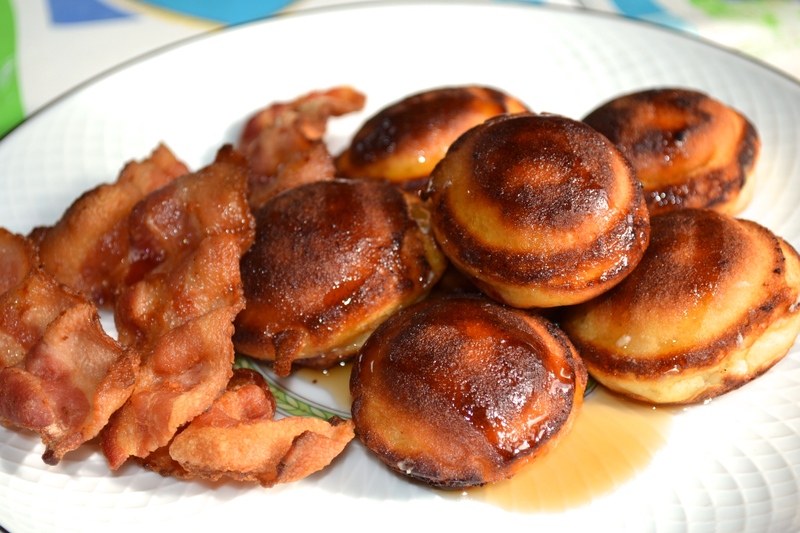 I use a ready-made traditional pancake mix but there are standard ebelskiver batter recipes to be found online. 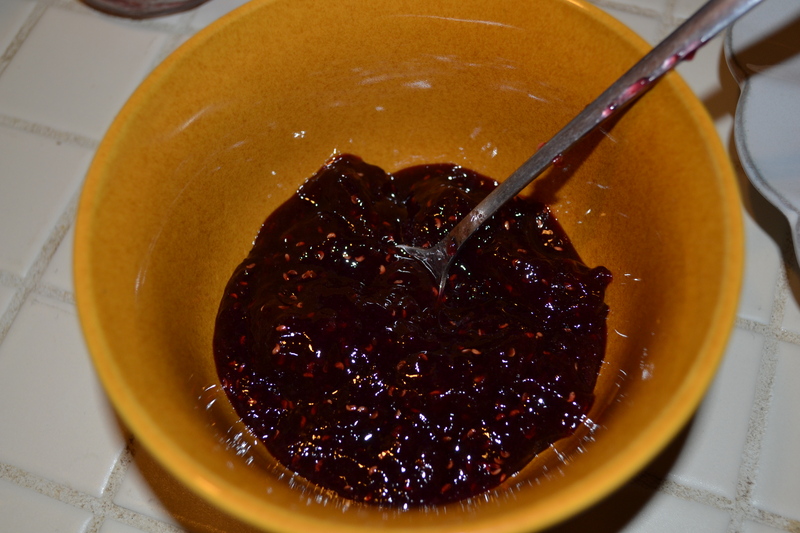 Red raspberry preserves warmed up in the microwave to make it easy to spoon into the pancakes. Set aside for later. 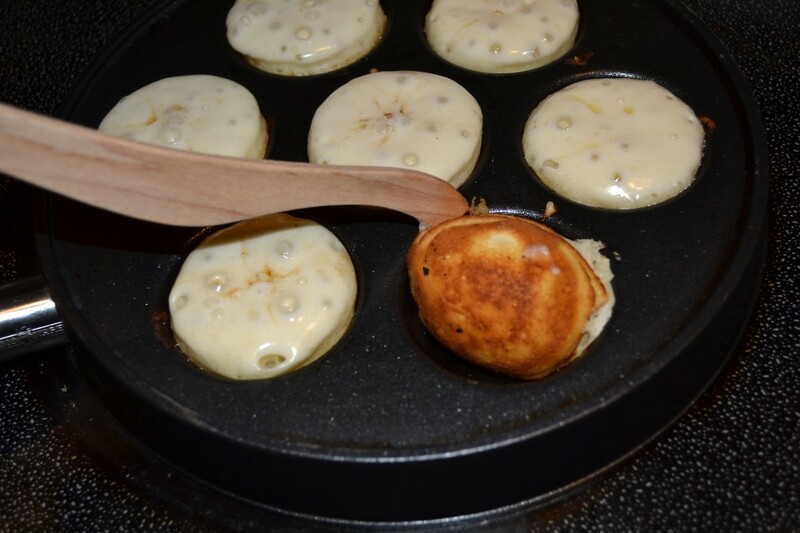 I have these ebelskiver paddles (purchased at williams-sonoma – $12.00). They are specifically made to turn the spherical pancakes but even with these paddles it is a tricky skill that takes some practice. 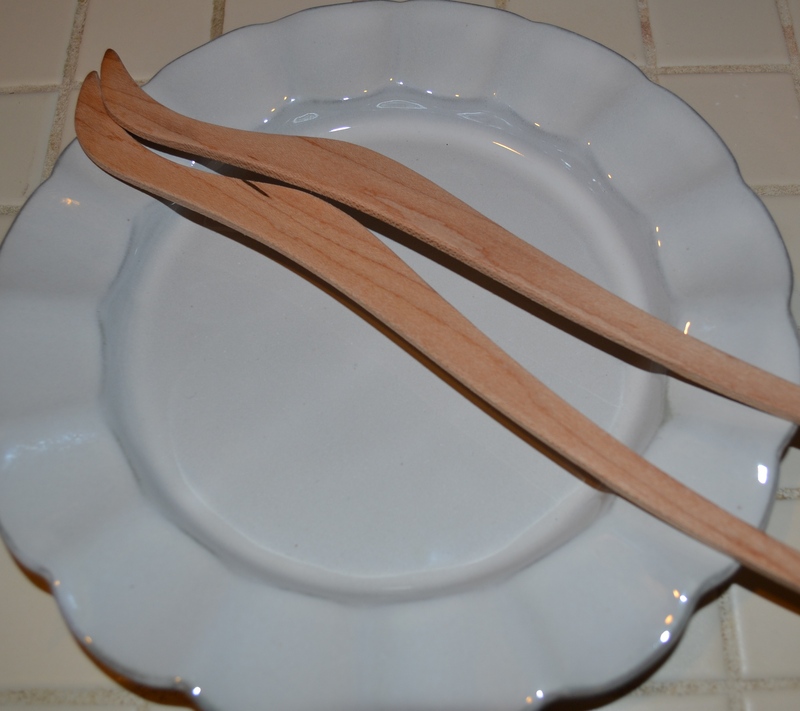 If you do not have these paddles bamboo skewers will work as well. 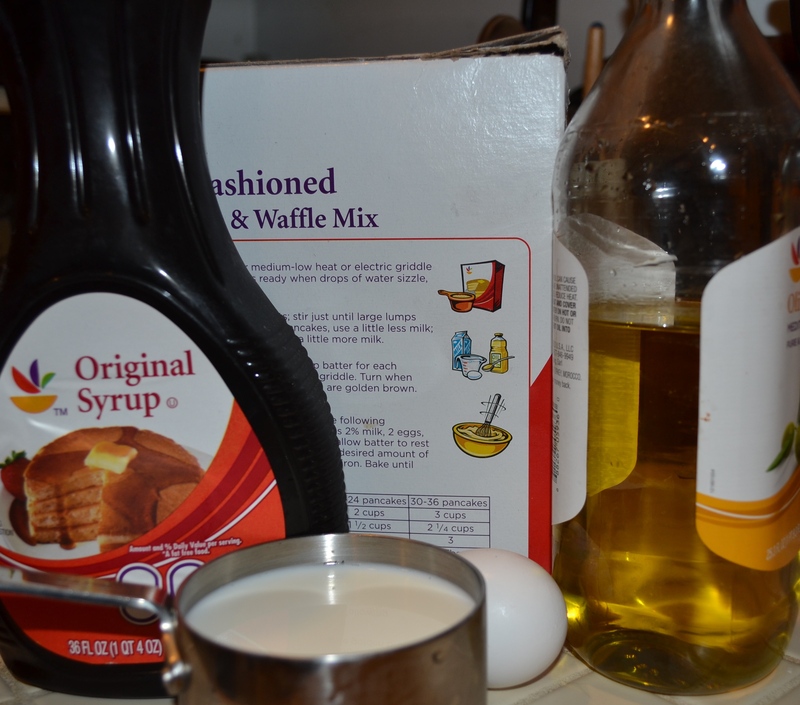 Make your batter according to the recipe on the box or from scratch if you prefer. 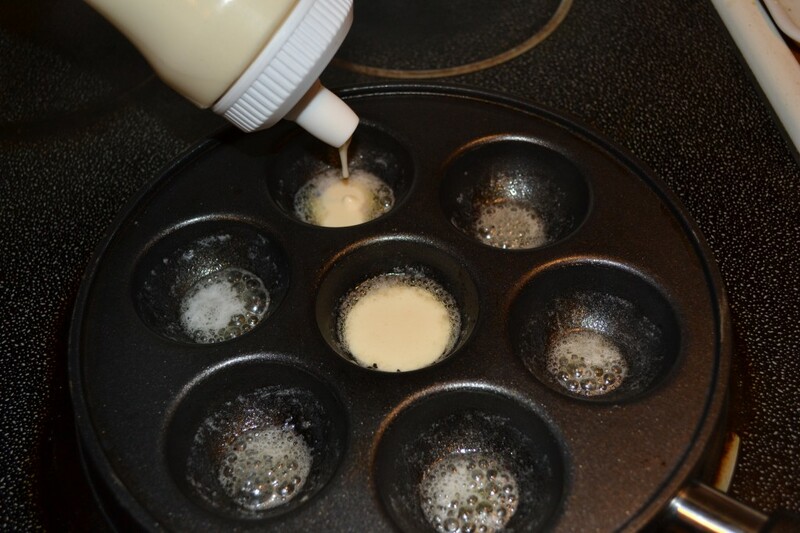 I have a batter dispenser that makes it so easy to fill the pancake wells in the pan. 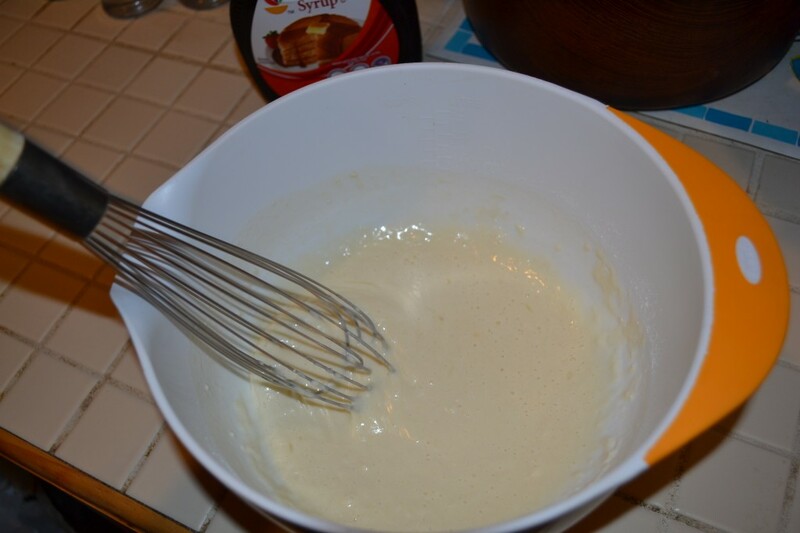 I just squeeze out the perfect amount of batter with no spills. This tube holds 3 cups of batter. 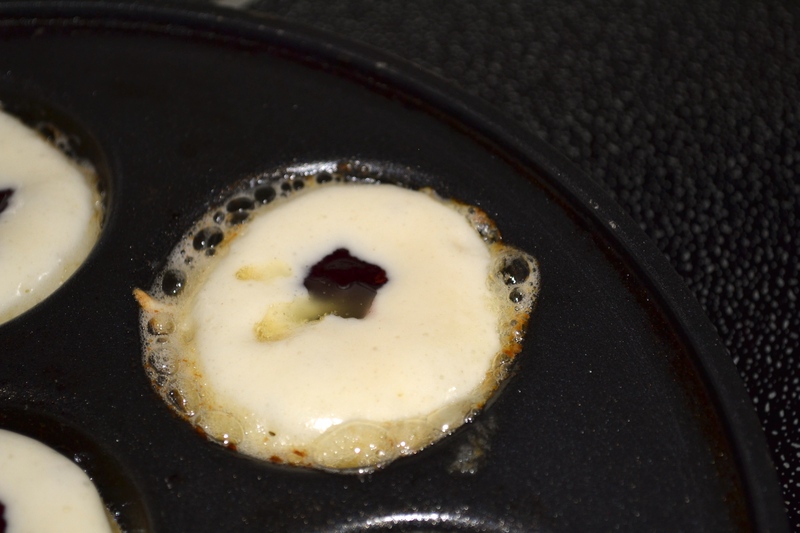 Heat the pan on your stove top at medium high heat and add a little pat of butter to each pancake well. Trust me, you need the butter, even though the pan is nonstick. When the butter is foaming your pan is ready to use. 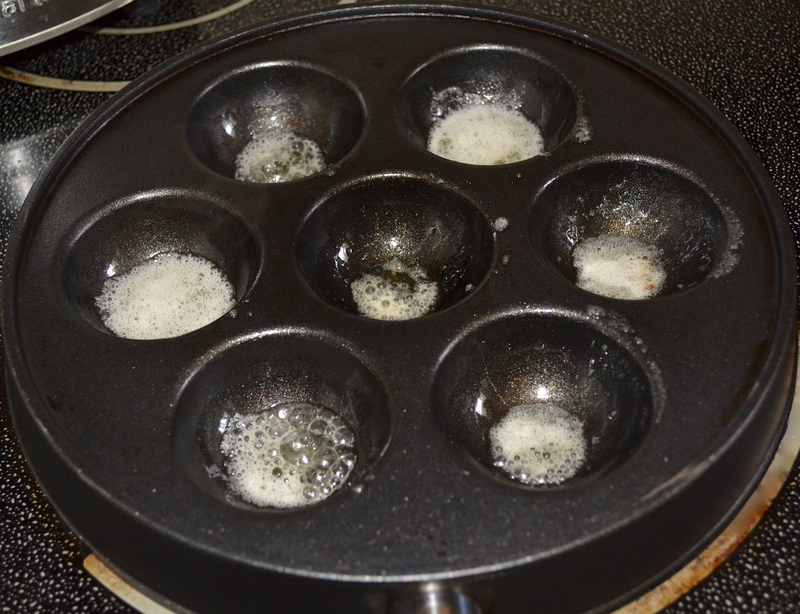 Squeeze batter into each well, about 1/2 full. 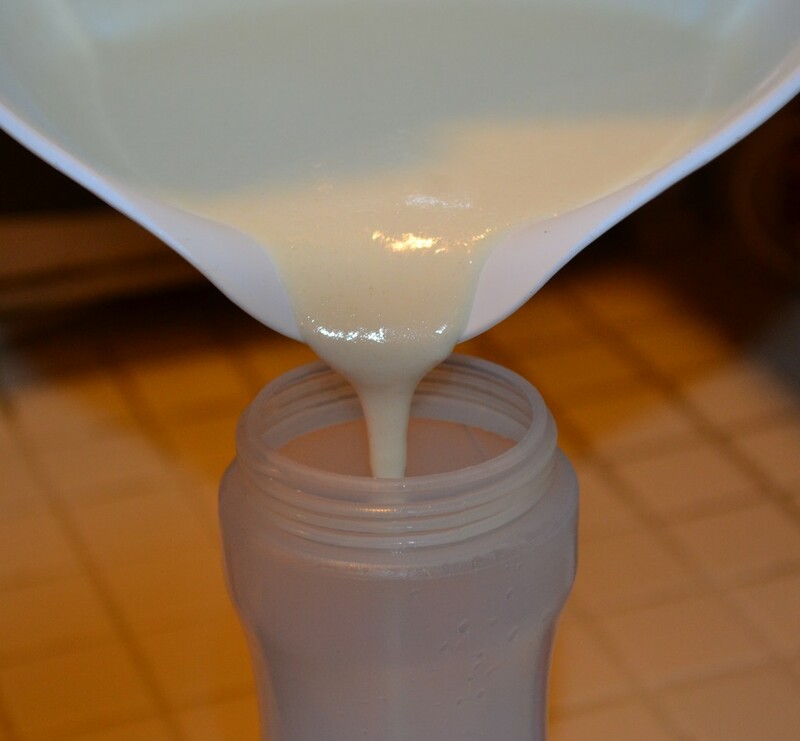 If you don’t have one of these squeeze tubes then a ladle will work perfectly too. 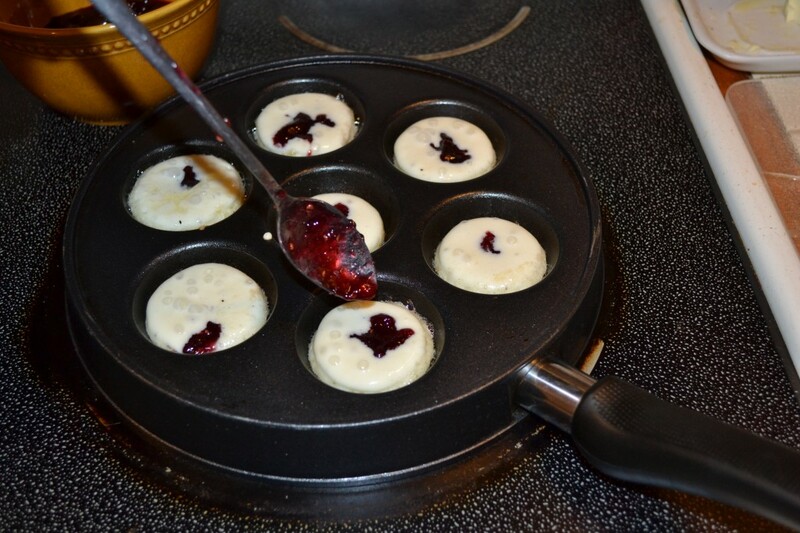 Once you have poured batter into all the wells grab your raspberry preserves and quickly drop a teaspoon of preserves into the center of each cooking pancake. 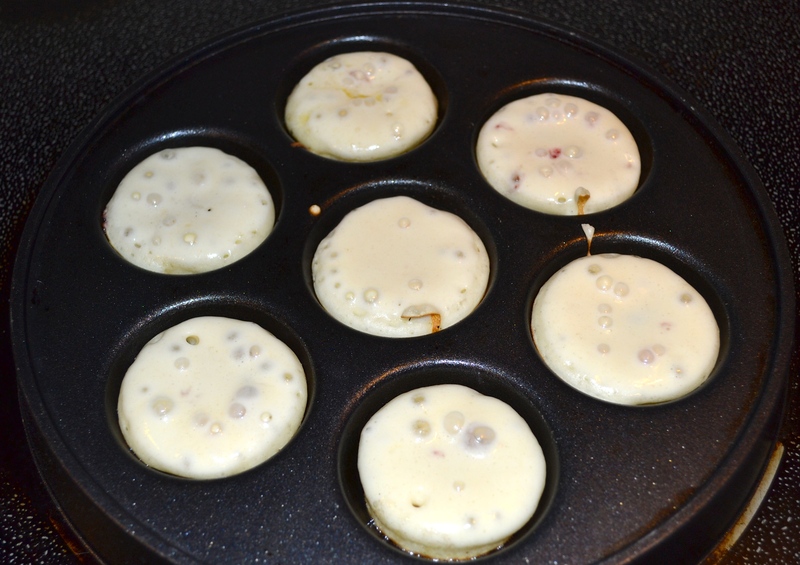 After you have spooned in the preserves you have to go back over the top of each pancake with more batter. 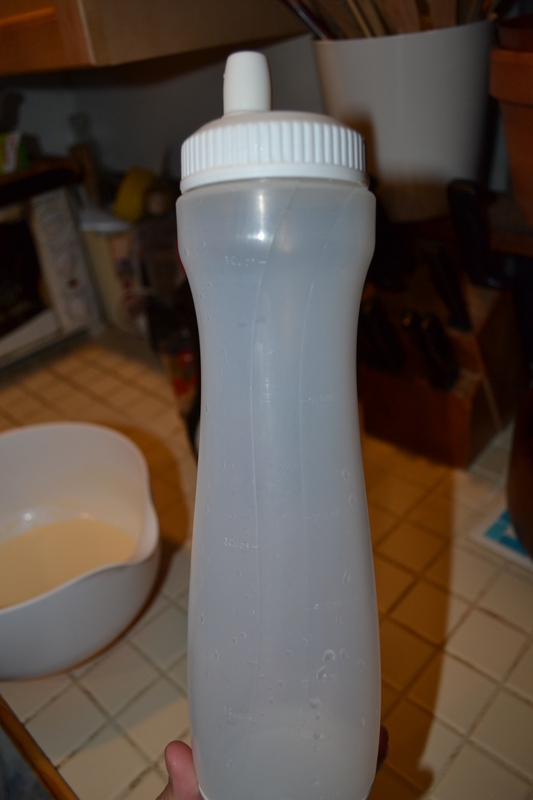 You are sealing in the preserves so be sure to cover each completely. 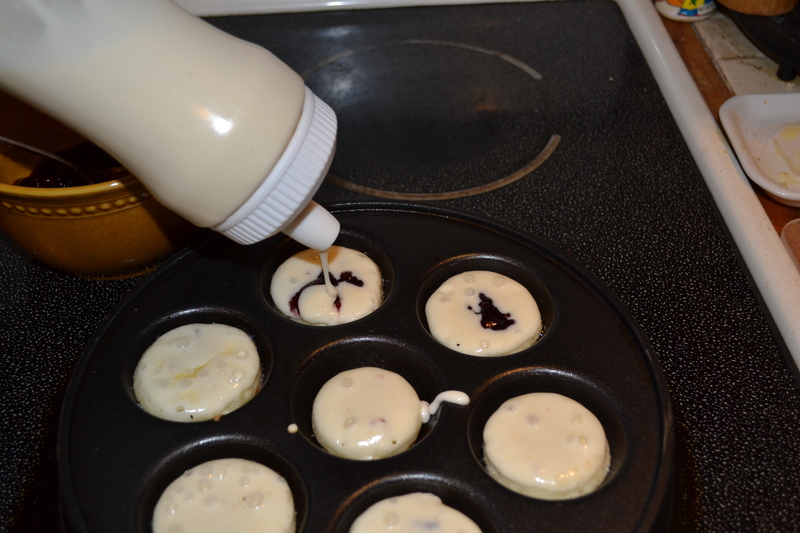 Below you see the pancakes fully covered with batter, sealing in the preserves. This step is important because the preserves have natural sugar in them and it will burn if exposed to the hot pan. I have had many a sticky, burnt mess on my hands when making this recipe. Let the pancakes cook until you see the top is covered in bubbles — just as if you were cooking on a traditional frying pan or griddle. Success!! All turned and not too much mess. 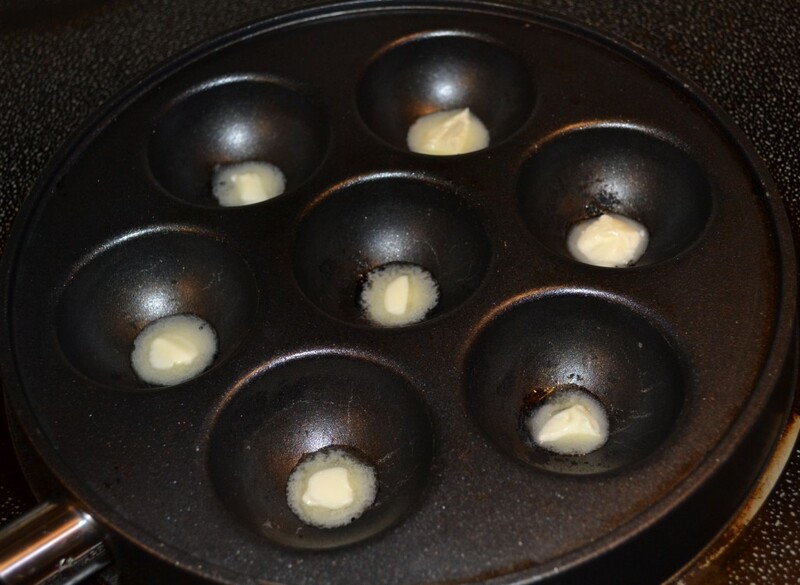 Continue to cook on this side for a minute or two and then remove ebelskivers to a warm plate and continue the process for the next batch. 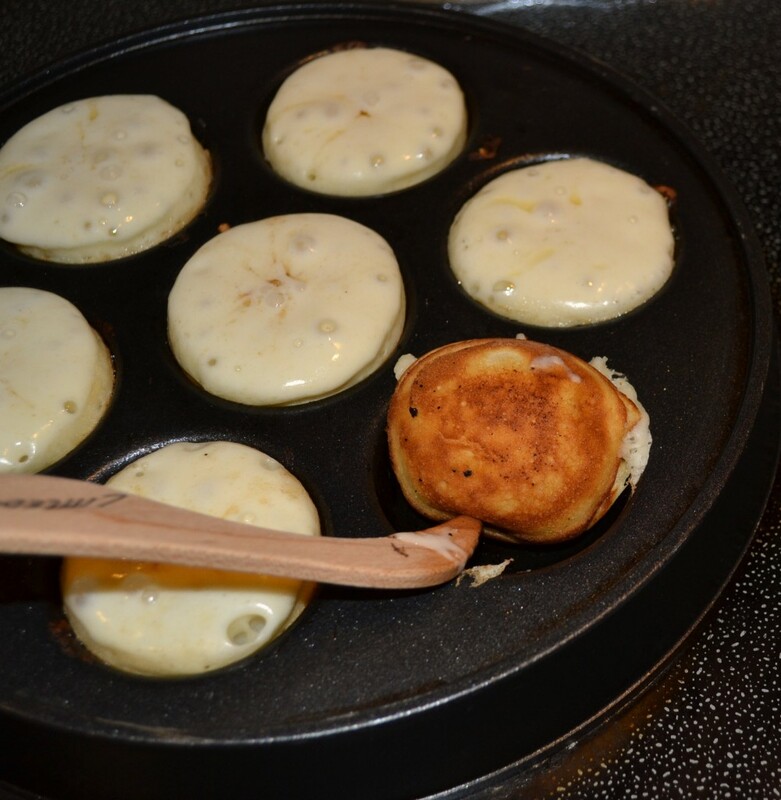 The ebelskivers fall easily out of the pan when they are finished or you can pop them out with a bamboo skewer. The finished product, with a side of bacon and golden syrup over the top. YUM! 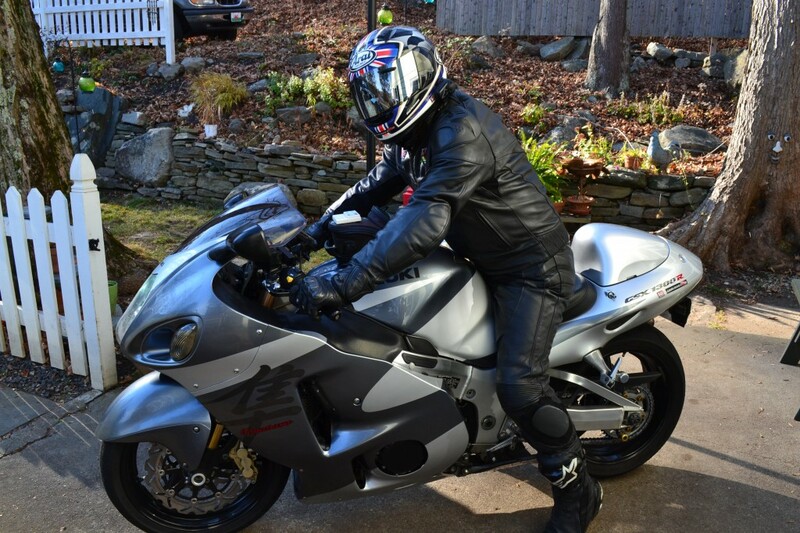 On a side note: the hubby went out for an early morning ride. Brrrrrrrrr! It was only in the 30’s this morning – I stayed in the kitchen where it is warm and cozy. 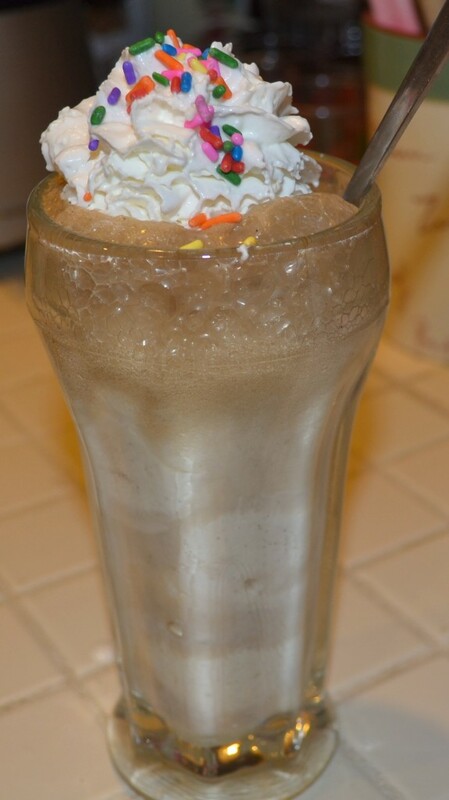 I made beef stew with dumplings for dinner saturday night and ice cream floats for dessert. It was an all around hit with the family and one of my tried and true dishes. I am cooking all my well-worn recipes this week as my sister is here visiting us from California. 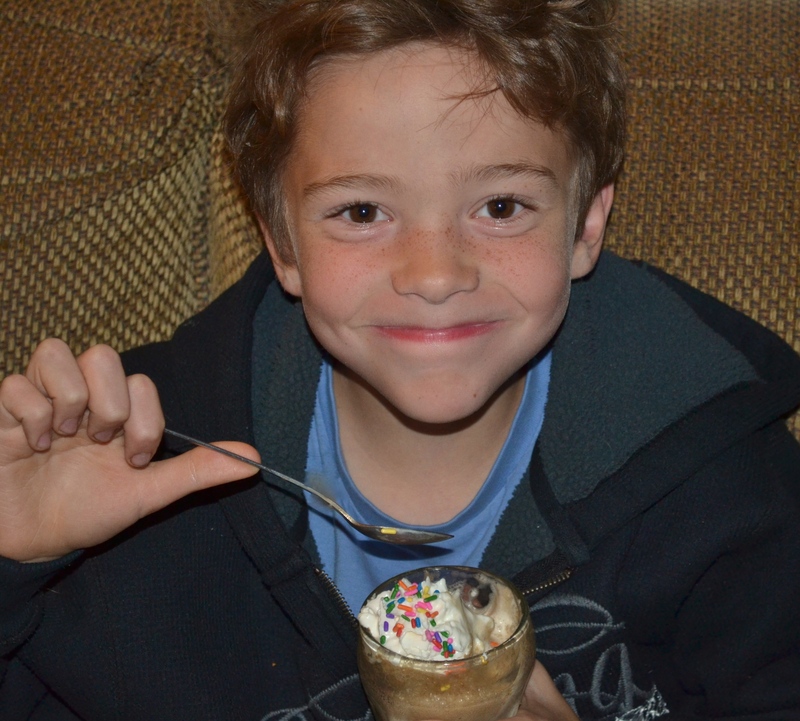 We have been testing some new recipes that I will share here on the blog once they are perfected. The boys are on cloud nine as Aunt Sue is there favorite…she is not afraid to take them up on all dares, bets and shenanigans. They love her and so do I. It is wonderful to have such a carefree, fun-loving sister and her visits are some of the highlights of our year. 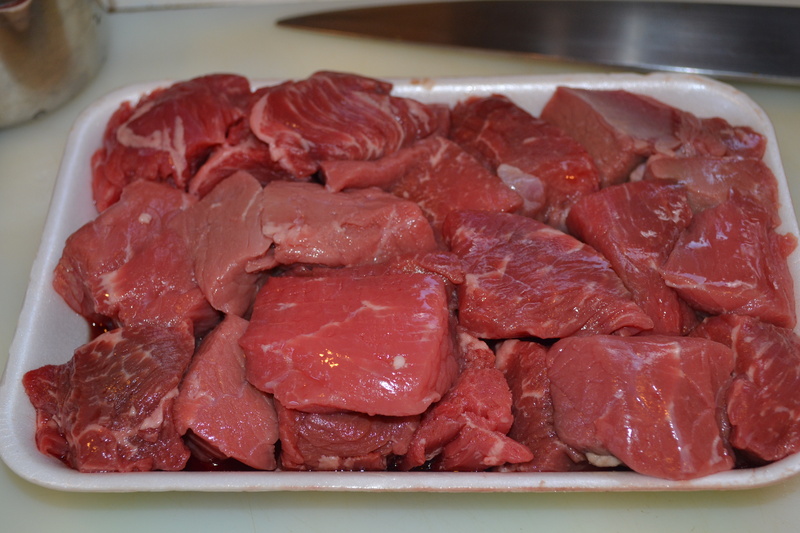 1 1/2 pounds beef round cubes. I rinse and pat dry and then take each big piece and cut it into smaller pieces. 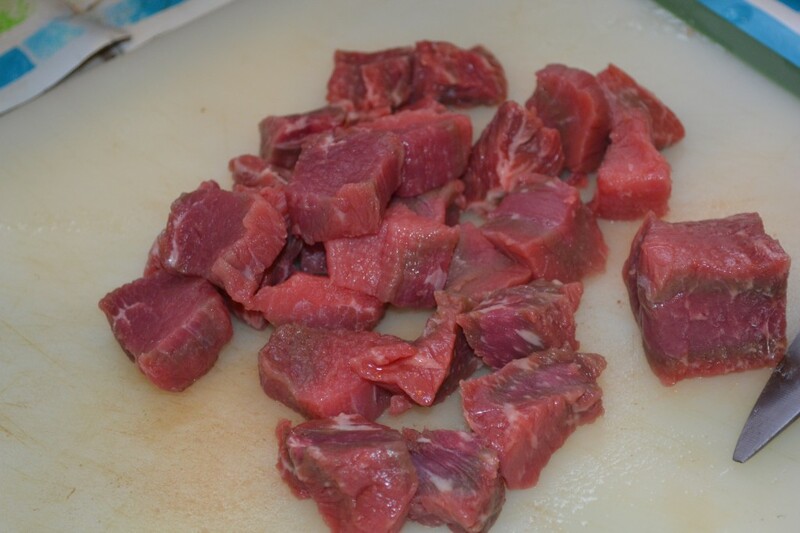 The beef cooks faster and it is easier to eat in more bite size pieces. Heat some olive oil and a Tbsp. of butter in a stockpot on medium heat. 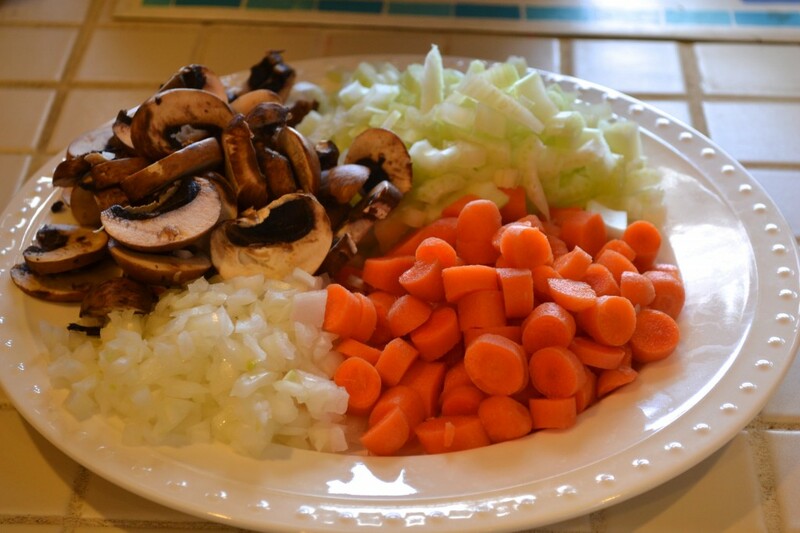 Add in the chopped vegetables and cook until softened, then remove the vegetables from the pot to a plate and set aside. 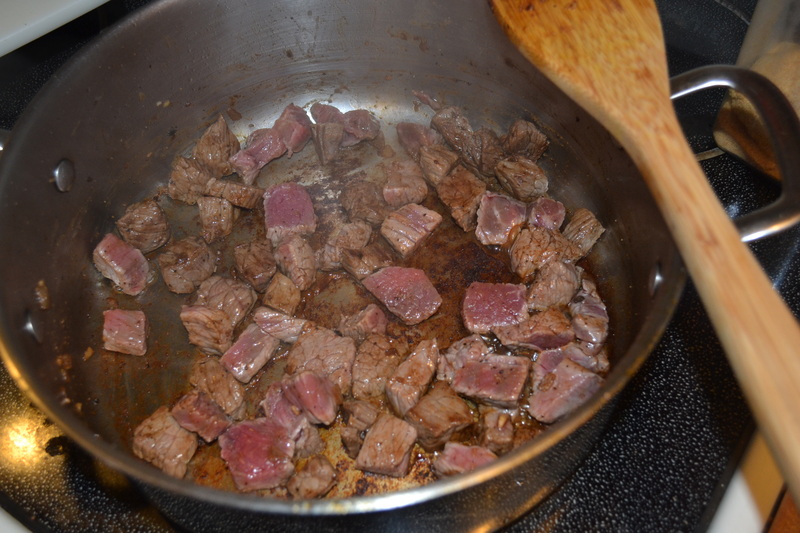 Add some more oil to the stockpot and drop in about 1/3 of the beef cubes. Brown them well and add salt, pepper & garlic powder. When browned to your liking remove the beef to a plate and drop the next third of beef cubes into the pot. Add more olive oil if needed and salt, pepper & garlic powder. Repeat for the final third of the beef cubes. 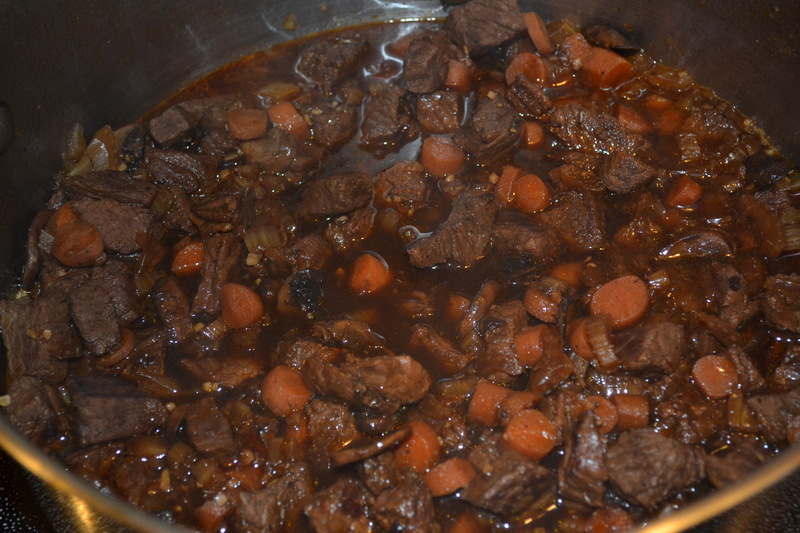 I brown my beef in small batches because if I were to put it all in the stockpot at once, the moisture that comes out of the beef would braise it and it would not brown properly. It is best to brown meat in small batches. Bring the pot to a rolling simmer and cover. I let this go for about 15 minutes and then I come back and add in my cooked vegetables. 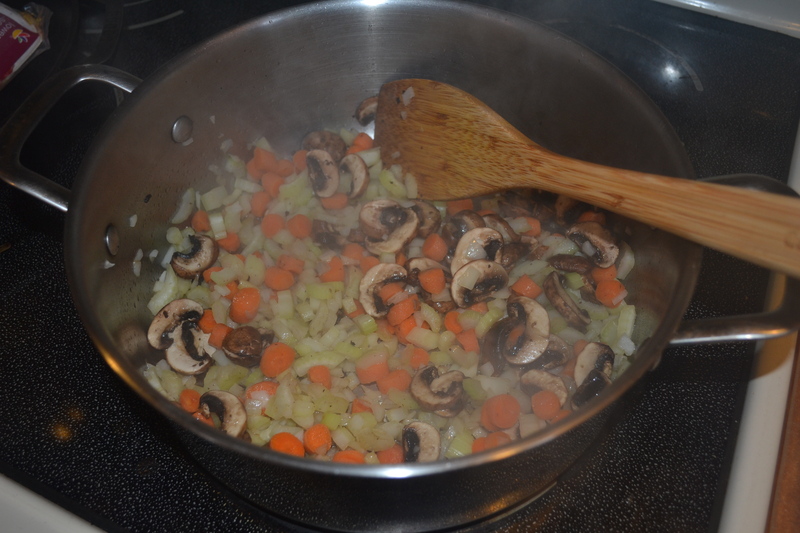 Stir to combine the vegetables with the beef and broth. 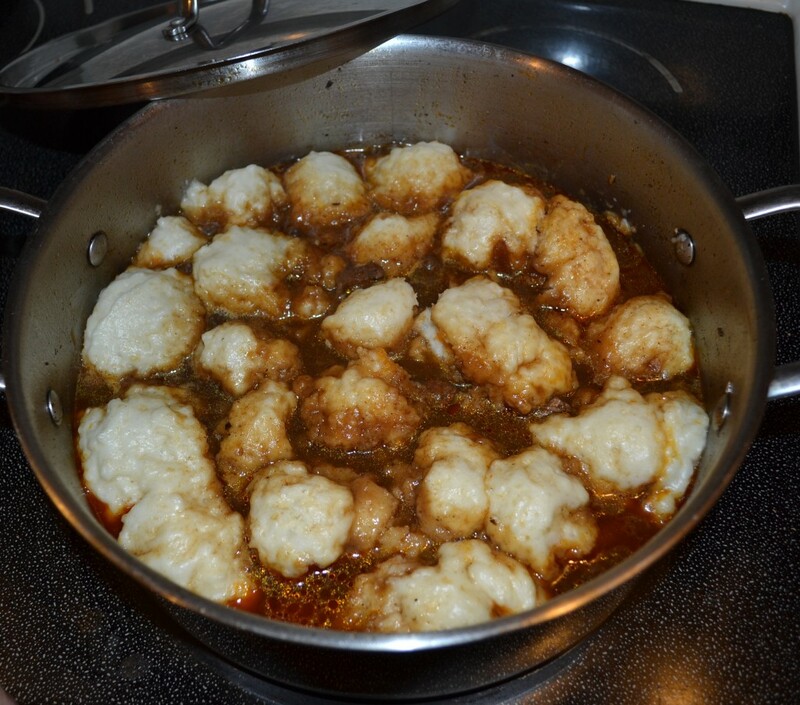 Note: It may seem like I have too much liquid in the pot but remember, the dumplings will absorb liquid as they cook and the stew will thicken as the dumplings are basically flour and milk. 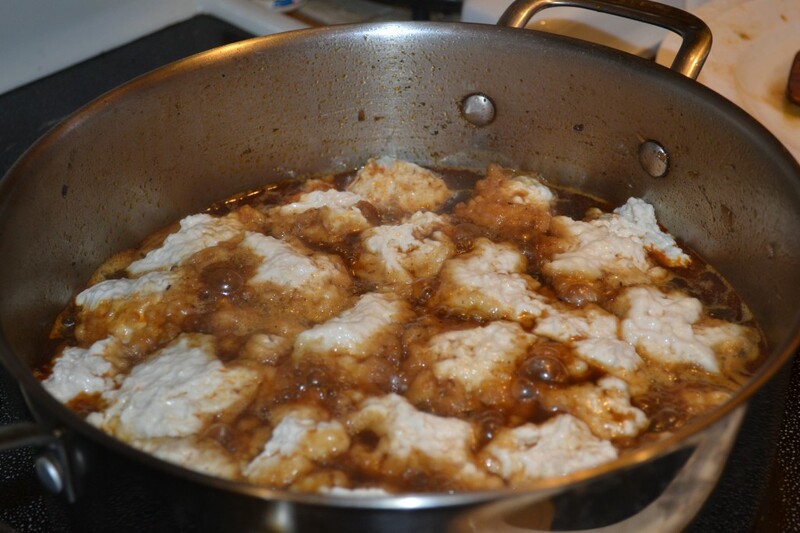 If you would rather use only 3 cups of beef broth to start and then add an additional cup later as the dumplings are cooking then please go ahead and do that. Some people like stew to be very thick and others like them thinner. It is up to your personal preferences. Bring the stockpot back to a simmer and let the beef & vegetables cook (covered) at a rolling simmer for another 30 to 45 minutes. Taste test your beef to make sure it is tender and cooked through. While the stew is cooking I prepare my dumpling mix. 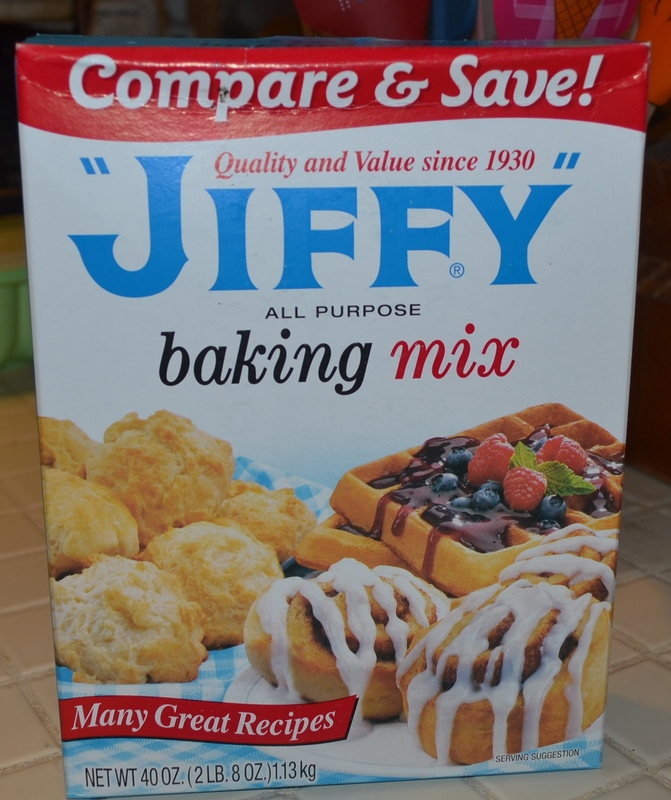 I use Jiffy Baking Mix as I like it better than any of the other brands out there but you should use whatever you like best. The dumpling recipe calls for 2 cups of baking mix and 2/3 cup milk. Combine ingredients until blended and then spoon the dough into the simmering beef stew. 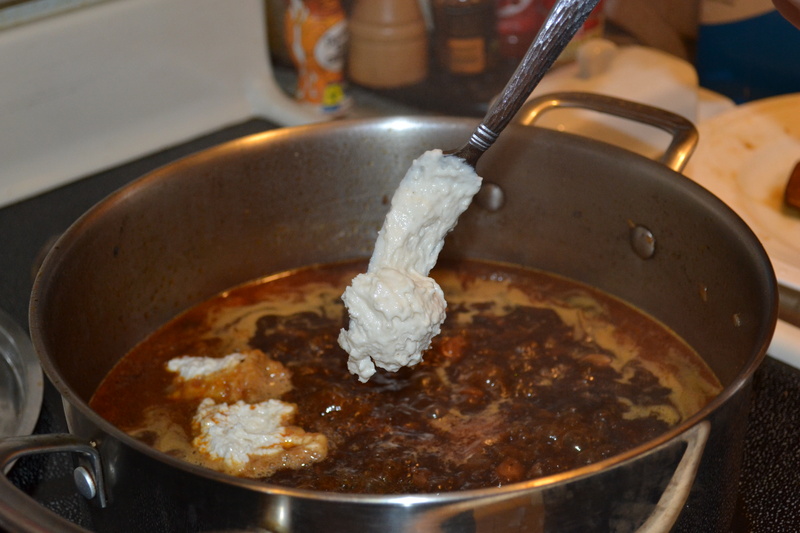 Note: the dough is quite sticky, I use a fork to scoop it out and drop into the pot of rapidly simmering stew. Cover the entire top of the stew with dumplings. They sink a little bit and it looks messy but believe me when I say these little babies are light, fluffy and delicious when they are finished. 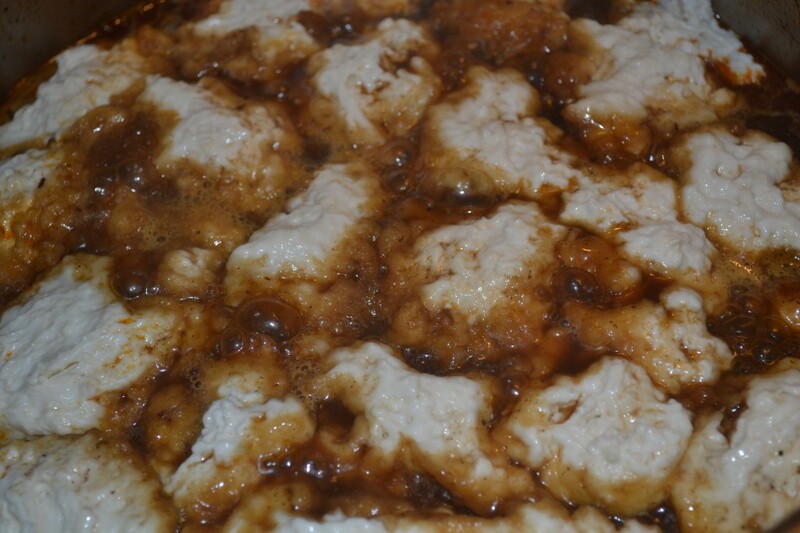 After I drop in all the dumpling dough, I cover the pot tightly, reduce the heat a little bit so the simmer is medium – not rapid, and let the dumplings cook for about 12 to 15 minutes. When the dumplings are finished they are puffy and dry on top. You don’t need to turn them over in the broth for them to cook properly. Remove the pot from the heat, ladle stew and dumplings into bowls and enjoy! 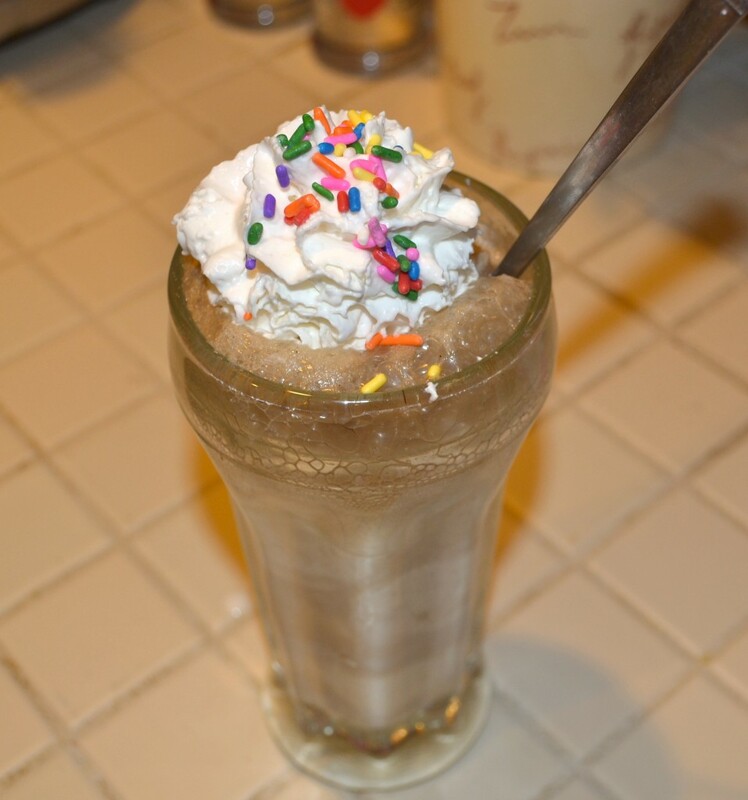 After dinner it was time for old-fashioned ice cream floats! YUM!! 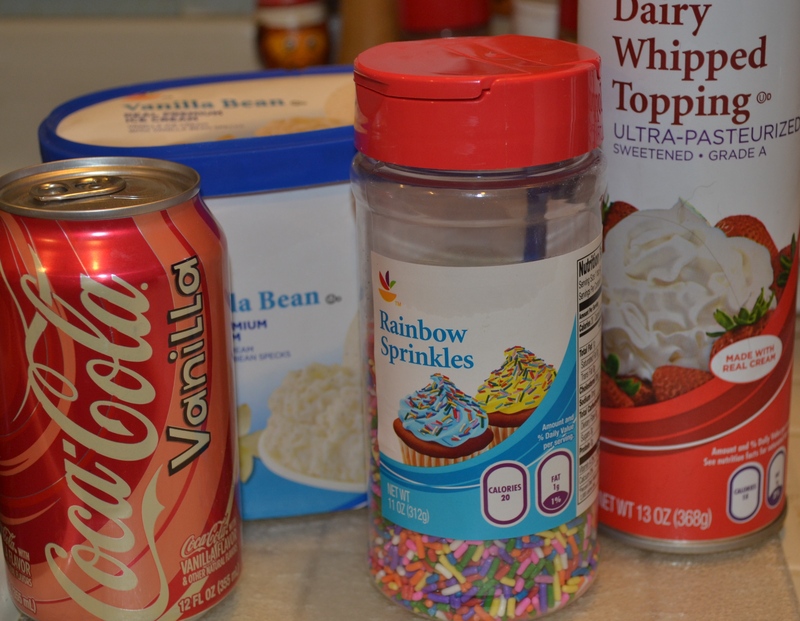 I started with the ingredients you see below. Vanilla ice cream, vanilla cola, whipped cream and rainbow sprinkles. I have some lovely old ice cream float glasses that I found at a local antique market. They were not expensive and I am sure you could find some at your local second-hand or antique store. They are easy to find and are a fraction of the cost of new ones from places like Williams-Sonoma and Pottery Barn. 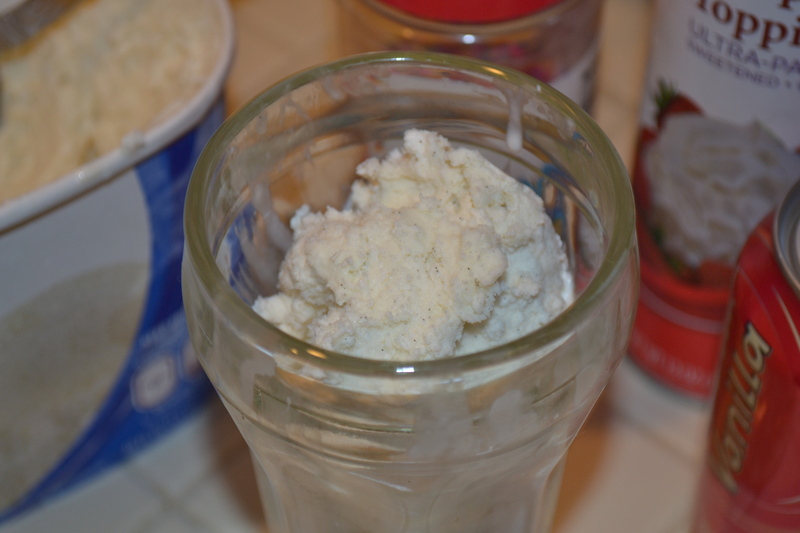 Into each glass I add two large scoops of vanilla ice cream. Next I slowly pour in the cola. 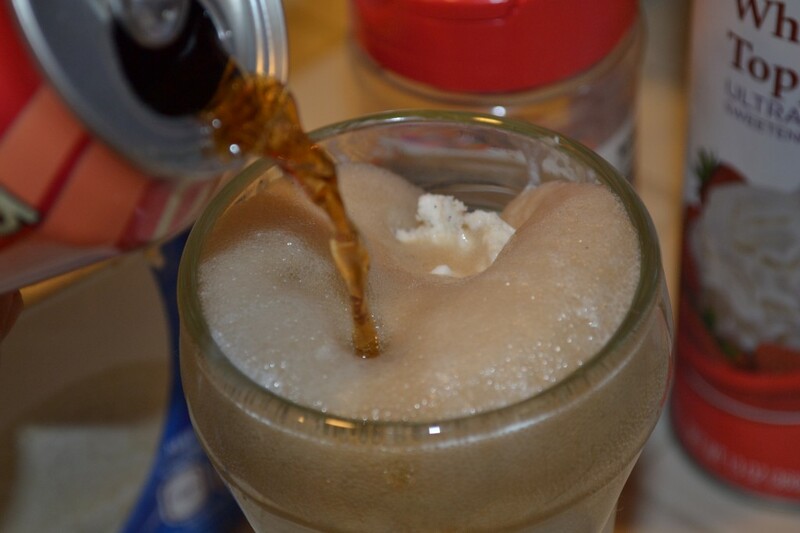 Be careful as the cola fizz comes up the glass quickly and it can overflow the sides. Top with whipped cream and some rainbow sprinkles. Add a long-handled spoon and serve to waiting children. A happy child = a happy mom! As the weather turns colder and the days get shorter, comfort foods like beef & dumplings are just the thing to carry us through to the frantic days of the holiday season.